Works of public art have the capacity to resonate deeply, stimulate curiosity, and inspire the imagination in unexpected ways. At The University of Texas at Austin, the public art collection is one of the most distinguishing features of the main campus, shaping impressions and offering a distinctive setting for memorable experiences. As the university’s public art program, Landmarks enriches the lives of students and visitors by presenting art that is broadly accessible and free to all. More than forty works of modern and contemporary art are on view throughout the 433-acre campus. The collection not only enhances the beauty of the landscape, but also supports scholarship and learning by demonstrating significant art historical trends from the past seven decades. Landmarks projects are viewed by thousands of people every day. For many, the collection provides an introductory opportunity to engage with great works of art. Visit soon to discover why Landmarks is a point of pride for the university and all people of the State of Texas. Landmarks is led by its founding director Andrée Bober, who oversees the development of the collection and a vibrant range of programs that support scholarship and learning. She reports to Douglas Dempster, dean of the College of Fine Arts, and works closely with the Landmarks Advisory Committee, the associate vice president for Campus Planning & Project Management, the Campus Master Planning Committee, and the senior vice president and chief financial officer. What is the history of Landmarks? 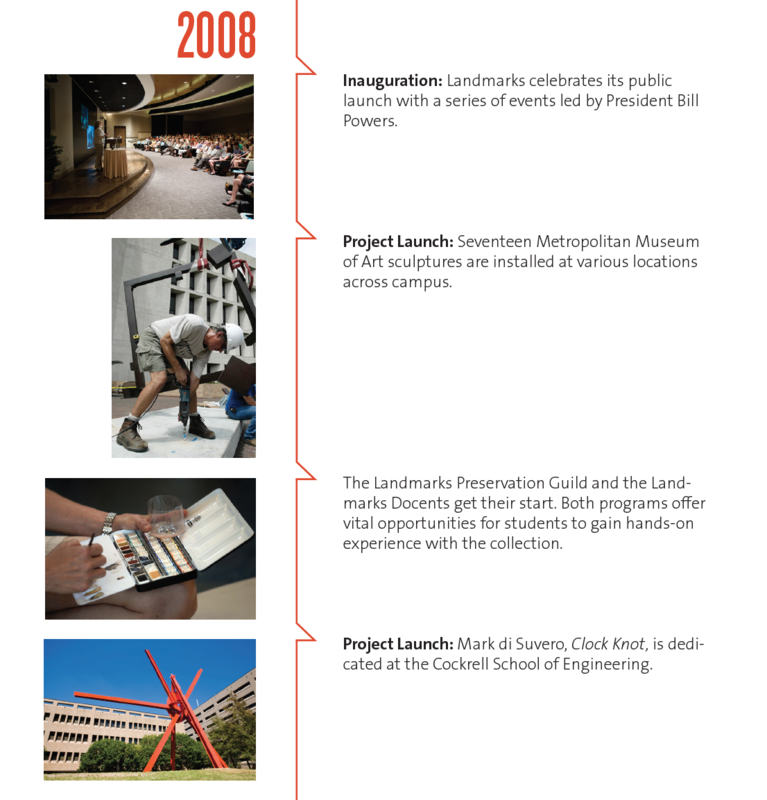 View the full Landmarks timeline. Who is on Landmarks staff? Please send an email to Landmarks staff. Which projects participate in the percent-for-art allocation? In collaboration with the eventual users of the building, the provost, senior vice president and chief financial officer, and the associate vice president for Campus Planning & Project Management determine allocations. Considerations include the degree to which the university is raising construction funds for the project, the overall project budget, and the location and use of the building. What criteria guide the selections? What is the Public Art Master Plan? Peter Walker Partners created a Public Art Master Plan (pdf) to ensure a comprehensive approach to building a collection of public art. The plan corresponds to the 1999 César Pelli Campus Master Plan and it serves to guide overall public art acquisition and placement. Among many considerations, it proposes the best locations for installations of public art to provide visual anchors at gateways, to accentuate main axis corridors, and to delineate architectural edges. Why is photography not permitted? The University of Texas at Austin and its affiliates enjoy a limited right to reproduce images of Landmarks’ projects for educational and promotional purposes. The university does not own the copyright to these works and it may not reproduce these images for commercial purposes. Any party who seeks to reproduce art in the Landmarks collection for commercial gain must first obtain permission from the copyright holder, which typically belongs to the artist or the artist’s estate.